Those in their 40s and above previously had one option when undergoing Laser eye surgery, and that was to have their distance vision corrected. The compromise was the need for reading glasses for fine print. Solutions such as monovision (aka Blended Vision), made one eye shortsighted compromising distance vision but providing near vision. Many patients have difficulty coping with monovision / blended vision. Now with SUPRACOR this is no longer necessary and both eyes can potentially be treated to provide simultaneous distance and near vision. Eliminate the need for reading glasses without the compromises of the past. A Lasik / Intralasik procedure that uses a specific and highly sophisticated treatment profile that enables near, intermediate and distance vision correction. The cornea becomes multifocal or varifocal. Will both eyes be the same? Supracor is an “art form” and success is highly dependent on good patient selection and surgeon experience. Initially distance vision can be compromised and in time this improves with recovery highly variable from a few weeks to many months. For this reason the surgeon will take into consideration each individual patient, the level of correction and their immediate visual needs. For those with Hyperopia (farsighted) correction, your surgeon may depending on your visual needs choose to perform a mild Supracor treatment in the dominant eye and a full Supracor treatment in the non-dominant eye. Visual recovery for distance is quicker. In Myopic (shorsighted) Supracor, the consultant might decide to only treat the non-dominant eye. Unlike Monovision / Blended vision where one eye is treated for distance and the other for near, this Laser eye surgery procedure is commonly performed in both eyes and between the two, patients enjoy visual freedom for at all distances. How does IntraLASIK Supracor work? This is a Lasik / Intralasik procedure where a corneal flap is created using the Intralase femtosecond laser. The flap is lifted and the Bausch + Lomb – Technolas laser is used to create a customised profile on the cornea. The profile has a small area in the centre of the cornea which is a little steeper and provides the near vision focus as well as an increase in asphericity which improves visual quality. In summary near vision is provided along with the benefit of better quality vision at distance! 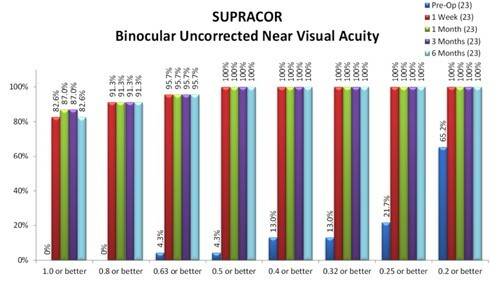 How does Supracor differ from PresbyLASIK advertised by other companies? PresbyLASIK uses a very different profile on the cornea, the side effect of which is the inducement of undesirable aberrations. These result in night vision problems such as halos and glare. Supracor on the other hand does not induce these visually disturbing aberrations but still provides distance, intermediate and near vision. A dramatic difference is noted immediately in terms of near vision and all patients are able to read a newspaper immediately after the procedure. To begin with the treatment does make patients a little shortsighted (-0.50D), in other words vision is slightly blurry at distance and this improves over the following weeks. Distance vision continues to improve month by month and 20/25 vision is obtained in 74% at 3 months 96% at 6 months. (Multicentric CE marking study). How do I know if I am suitable? Suitability for treatment requires a thorough consultation with specific investigations including the degree of Presbyopia (requirement for reading glasses). Treatment is available for those who are both Farsighted and Shortsighted. 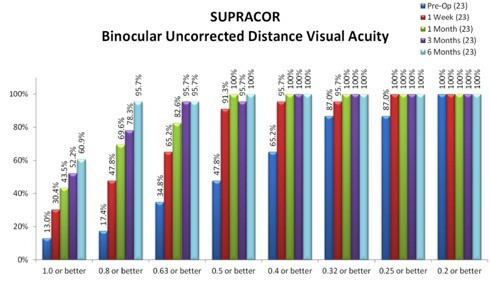 Find out if you are suitable for Supracor – contact Centre for Sight to book a free consultation. Can I be treated if I have previously had Laser eye surgery? YES – patients who have previously had Laser eye surgery have had successful outcomes following Supracor LASIK. Do I need to do anything special after the procedure? Supracor IntraLASIK is like IntraLASIK and aftercare is the same. These are results from the CE marking European Multicentric Study (courtesy Technolas) for Hyperopia (Farsightedness). Notice distance vision improves with time, however near vision is excellent right away and remains stable.